Good news! For the home chef, it's perfectly fine to buy your brisket at the grocery store and don't think it has to be the most expensive one. When you pick up a package, look at three things: liquid (not too much in the package), plastic (that hasn't pulled away from the meat), and color (should be light pink, meaning the cow ate quality feed). Don't stress too much over the marbling. The other three factors are much more important to freshness and taste. Ronnie Killen suggests trimming, but make sure the fat cap is left a quarter of an inch thick. Why? To have your brisket be smooth and aerodynamic. After that, it's all about the rub. Killen's bottles and sells the perfect rub pre-mixed, but we've also included the recipe below. There's an art to the grill. Always cook the brisket fat side up with its thick end closest to the fire. Then, make sure the temperature stays between 225 and 250 degrees and there's not too much smoke. Cooking time will vary by size, about an hour per pound. 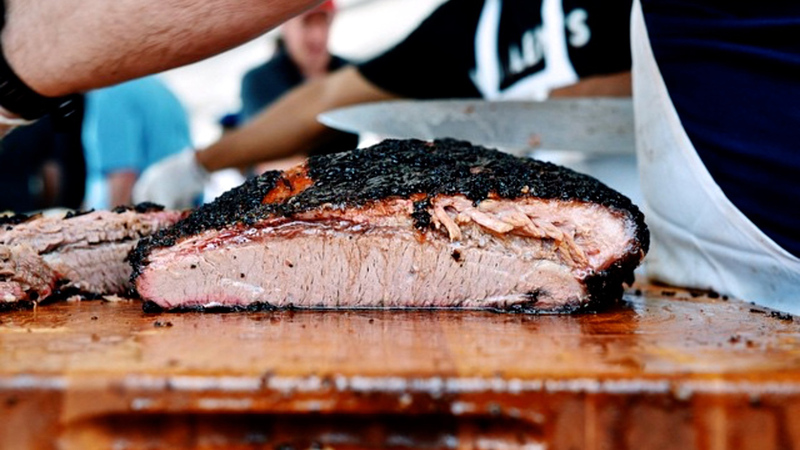 In the end, Killen says you want your brisket to pull apart, not fall apart on the plate. First, look for a dark crust. Then, make sure the center is 195-200 degrees. But don't get excited yet! The meat HAS to rest at least an hour. Yes, an hour to get juicy goodness! Wrap it tightly with foil and put it somewhere warm until then. Don't cook the next day. To reheat the leftovers, add them to a baking pan with about 1/4 cup of water, cover with foil, and bake at 225 for 30 minutes. Rub both sides of brisket with mustard. Sprinkle both sides liberally with chipotle powder, cayenne pepper, and sugar (or use Killen's BBQ Rub). Add a generous amount of salt and pepper to each side (or use Killen's Salt and Pepper Blend).